While nothing beats the timelessness of mixing neutrals in your home, the unexpected use of painted cabinetry is a design trend that adds a unique character to your home. 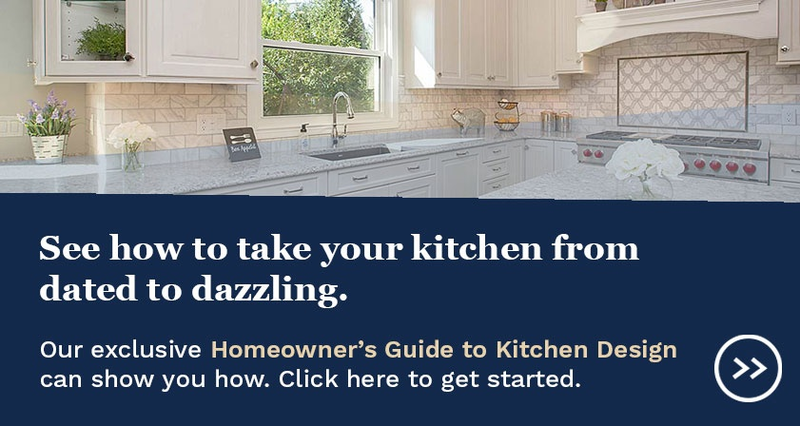 In the kitchen, when a cabinet is a different color than the rest of the space, it can highlight a certain feature or element, or can help visually distinguish a work zone. Painted cabinets in particular add the interest of an additional color to the space. 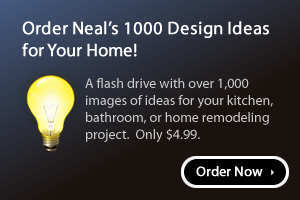 This can steer the style in a certain direction, or play up the homeowner's style. In either case, the use of painted cabinets is a hot trend that's worth considering. A cool gray island inthis open-concept kitchen relates to grays found through the space, including the natural stone backsplash. 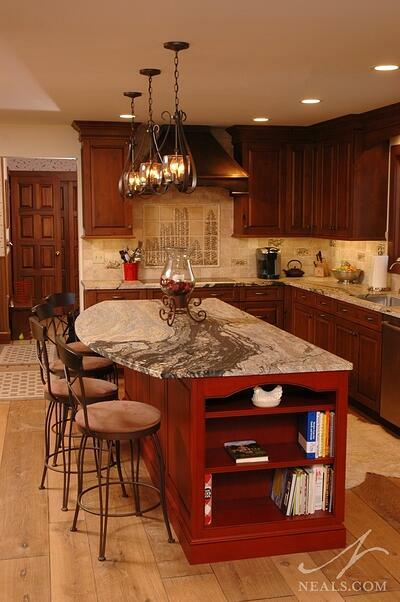 One of the easiest ways to add colored cabinets is to apply the color to your island. Since the kitchen island is already a stand-out item in the space, opting to finish it differently than the perimeter cabinets is a time-tested design choice. When thinking about using a color, consider the long-term impact of that choice. A soft neutral, or pale color, such as the blue-gray choice above, can lend a bit of depth to the kitchen's color palette without forcing itself into accessory or artwork choices. The red island here helps create a bold, rustic design style, in keeping with the homeowner's taste. Alternatively, a bold color choice can carry a design theme further, such as the sharp red island in the rustic kitchen above. When combined with stained cabinets elsewhere, a boldly-colored cabinet or zone can help create a lush environment that can invigorate your daily kitchen routine. Don't shy away from brighter tones if that's your taste, but take the time to make sure the choice isn't just a stylistic whim. Favorite colors or colors that can drive a certain style direction are better options than simply "hot" colors. A pair of navy blue islands pull the home's entire scheme together in the kitchen, and change with different layers of light. 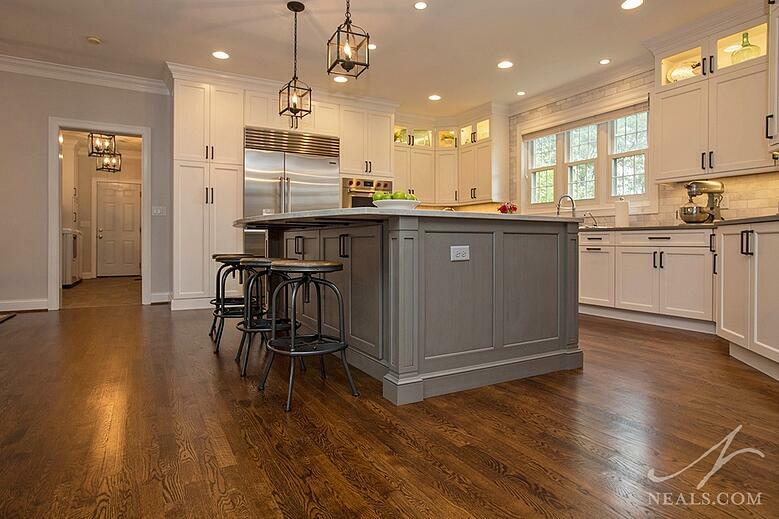 When looking at colored cabinetry, also keep in mind two key factors. First, how does the color look in different lighting situations? 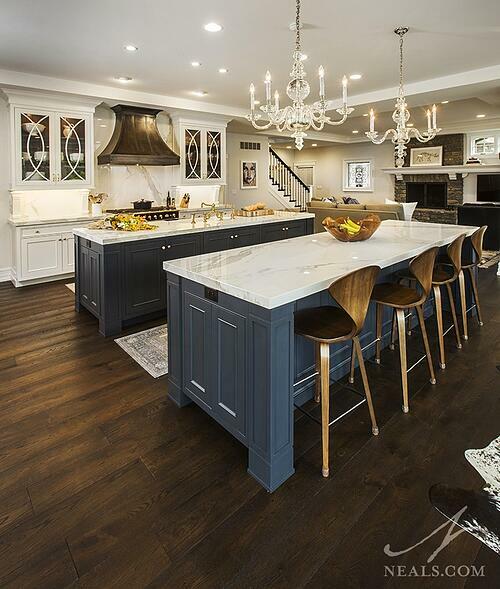 In the kitchen above, the islands are finished in a vintage navy blue. Natural light from the adjacent breakfast room creates a wider color range between the two islands. It's important to make sure that all the painted cabinets in your space are colors that work for you. The second factor, also at work in the kitchen above, is how the color you choose works with the total color scheme of your home. In this case, blue is a large player in the first floor of this home, so the navy blue cabinets are perfectly suited. If your home doesn't use a certain color anywhere else, consider how that color on a cabinet in the kitchen may or may not work. 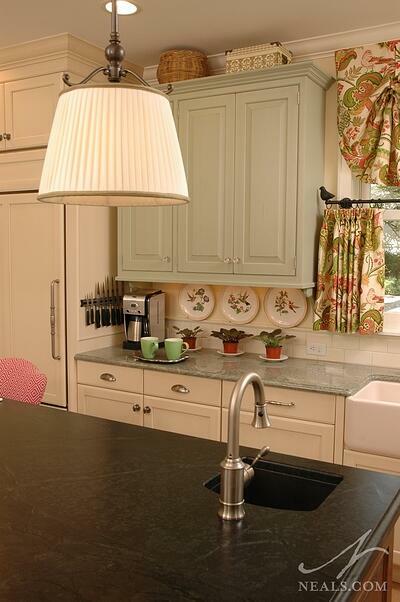 A pale green wall cabinet helps complete the color story in this eclectic kitchen. Islands aren't the only place a painted cabinet can be used. In the traditional kitchen above, a pale celadon green was used for the wall cabinets to set them off in this eclectic, cozy kitchen remodel. The use of the subtle color also pulls the kitchen's color scheme together by giving a nod to the green-toned granite countertop under it, and forming a contrasting note to the deep green soapstone on the island. Painted cabinets offer these types of color stories in a way that's harder to achieve with wood-toned stains or straight-forward paint colors like white or black. 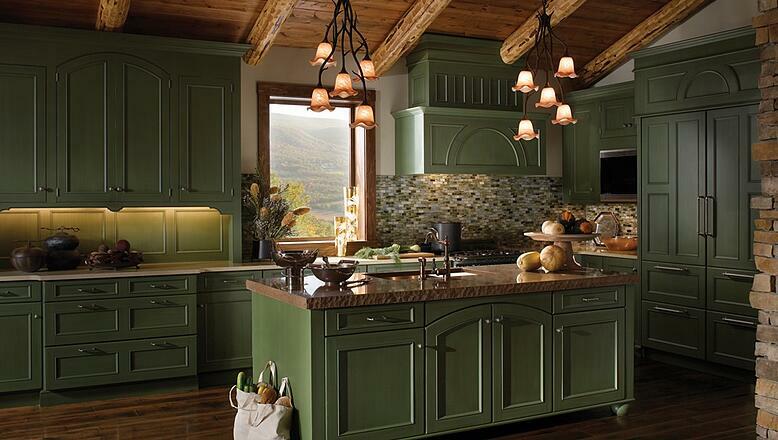 The deep green cabinets form a different type of neutral space where wood tones become accents in this kitchen from Wood-Mode. One last note: While the use of an all-over color isn't for everyone, keep in mind that once all the cabinets in a space are the same color, regardless of what that color is, it turns into a neutral. In the example above from Wood-Mode Cabinetry, the prairie green cabinets form a lush base that allows the natural wood accents in the room to stand out. This can translate to your own home by using painted cabinets as your main cabinet color to create a highlighting effect for elements that are a neutral color or natural material.